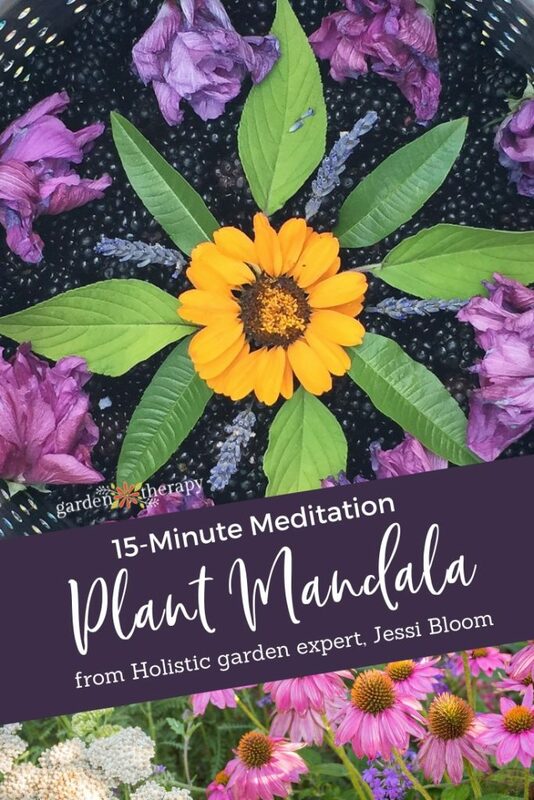 Practice mindfulness by engaging in a mandala meditation using a variety of found garden treasures. 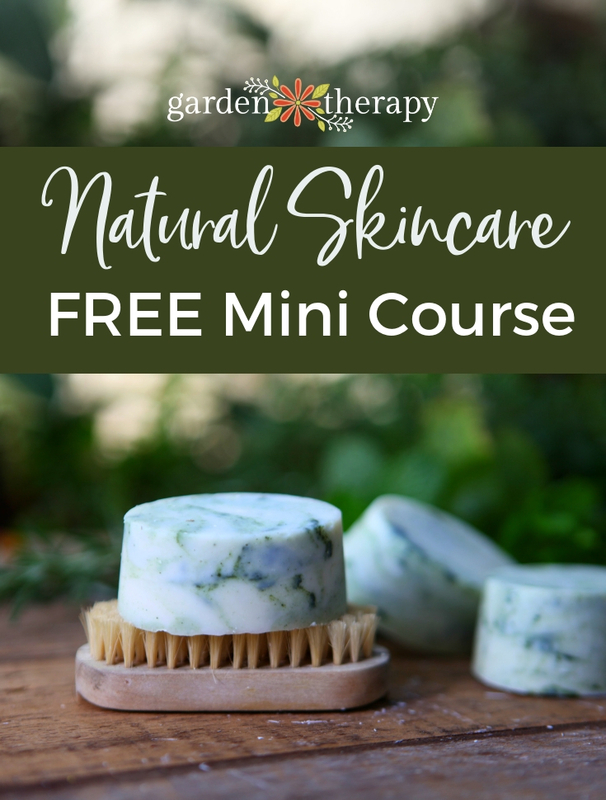 Discover the effects of color on emotions and how texture stimulates the senses in this quick 15-minute ritual that can be done right in your own garden. One of my favorite things to do is wake up first thing in the morning head outside and do a garden walk. Just taking a quiet moment to walk around my garden sanctuary to touch, feel, smell, and listen to the garden is both healing and energizing. It’s the place I found my garden therapy and I love the opportunity to get deeper in that relationship. 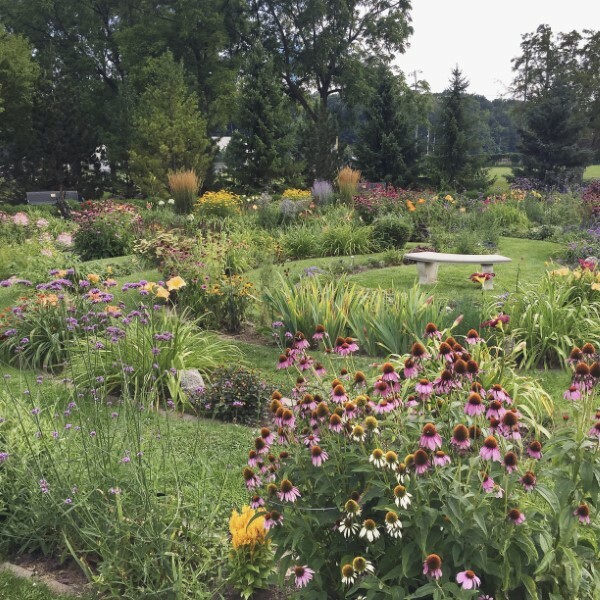 I’ve written often about the healing power that gardens have for me, and it’s always a joy to connect with people who have the same love of living better through plants. 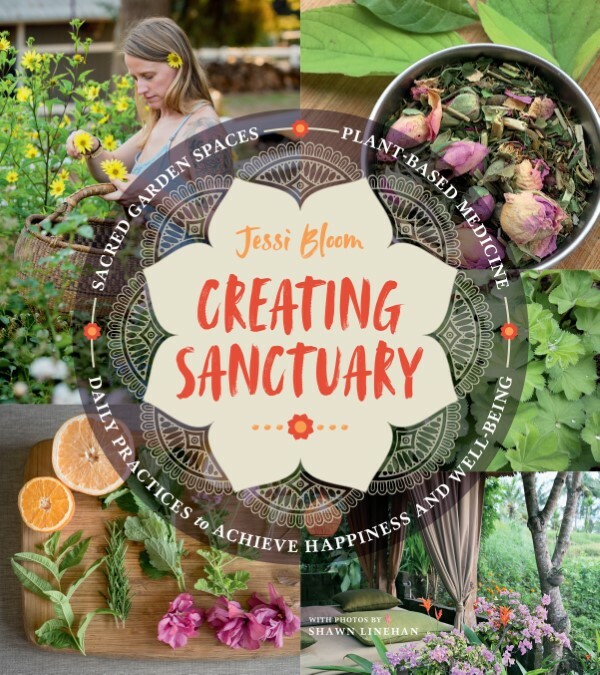 A few weeks ago Jessi Bloom’s new book Creating Sanctuary arrived in the mail and I couldn’t put it down. It’s filled with gentle suggestions for appreciating the relationship we have with plants and practical ideas to reconnect with the nature that lives right outside your garden door. I could feel her love and reverence of plants through the pages. I’m a huge fan of Jessi’s work. 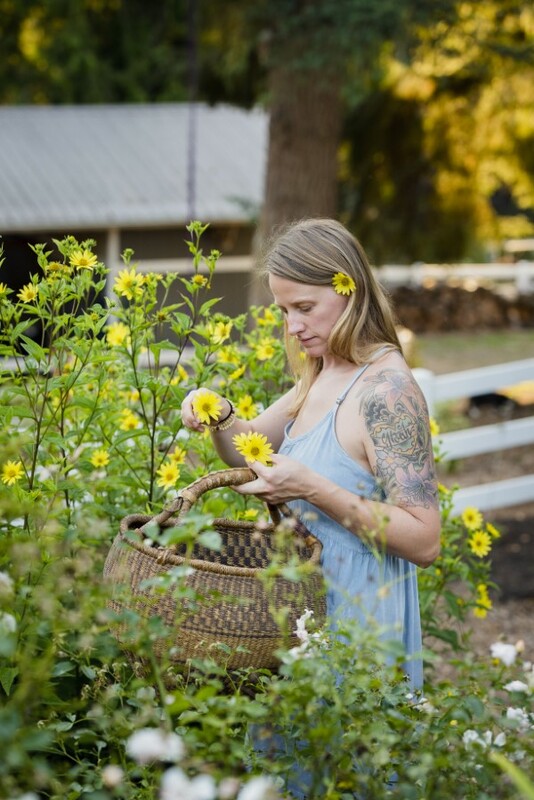 She is a Holistic garden expert who shares her knowledge of plants and their healing qualities through her books, seminars, and garden designs. 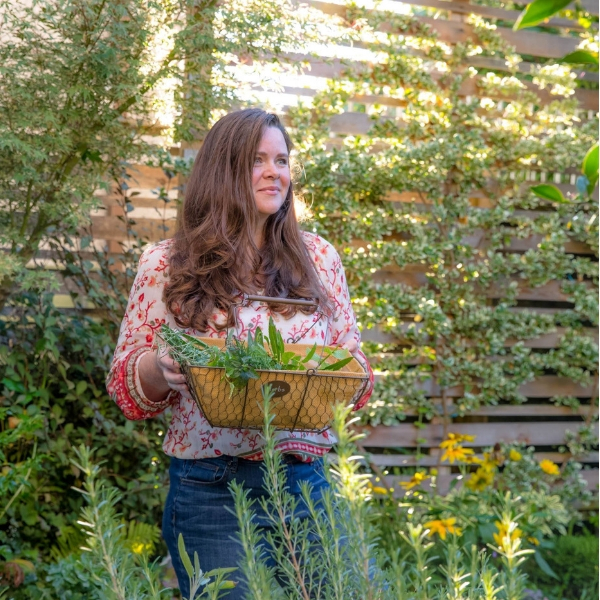 Her latest book is filled with ideas for creating your own garden sanctuary through plant-based medicine, sacred spaces, and daily practices to achieve happiness and well-being. If you’re looking to add some more magic to your garden then Creating Sanctuary is a great source of inspiration. While I’ve found many gems throughout the book, I’m particularly drawn to one of daily rituals from the book, mandala with plants. 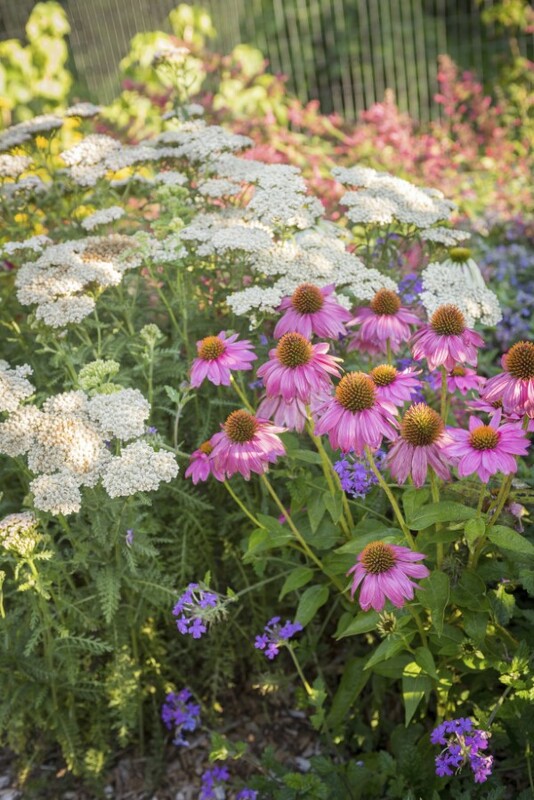 It is a beautiful way to experience and celebrate the garden’s gifts. 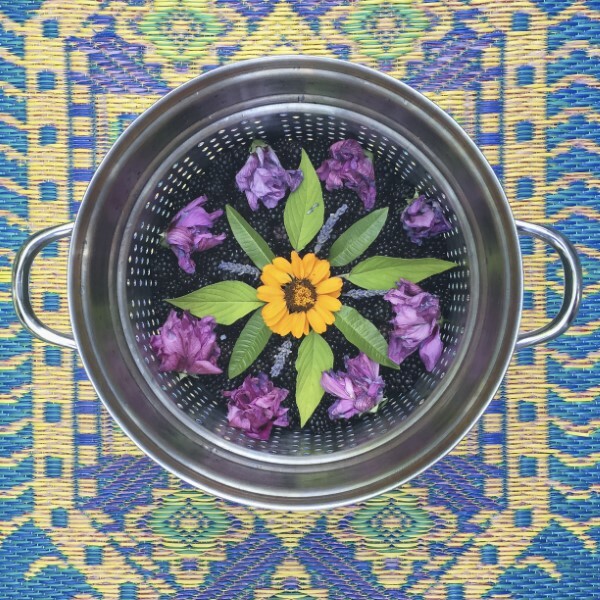 Jessi joins us today to share her wisdom for this healing ritual. Taken from Creating Sanctuary© Copyright 2018 by Jessi Bloom, photographs by Shawn Linehan. Published by Timber Press, Portland, OR. Used by permission of the publisher. All rights reserved. We spend so much of our lives using just one or two senses—maybe squinting at a computer screen or gluing our ear to a phone—that our sanctuary garden may offer the best chance we have to enjoy the full spectrum of sensory pleasures. There we can stuff our eyes with color and texture, treat ourselves to soothing sound and stimulating scent, please our palates with sweet fruits and wholesome vegetables and nuts and herbs, trail our fingers in the water and shuffle our bare feet in the grass. A mandala is a universal pattern that has found expression in many different cultures across time. Mandala translates to “circle” in Sanskrit, but mandalas can be square as well. The pattern inside of the circle or square is concentric—organized around a unifying center. The mandala pattern has special significance in Eastern religions, used as a focus of meditation, but it is also found in expressions such as labyrinths and medicine wheels. Both Tibetan monks and Navajo Indians create elaborate sand mandalas to demonstrate the reality of impermanence. Mandalas are used in sacred spaces as a template for laying out beds and paths and also as works of art. 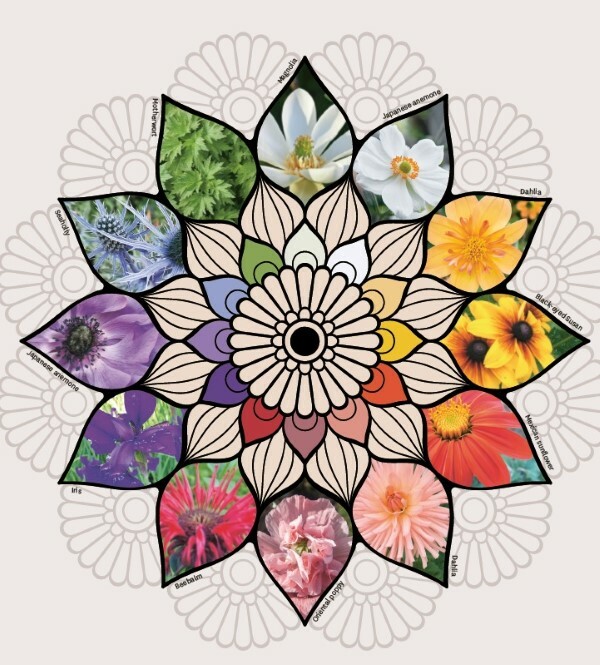 Create your mandala from materials such as blossoms and leaves. 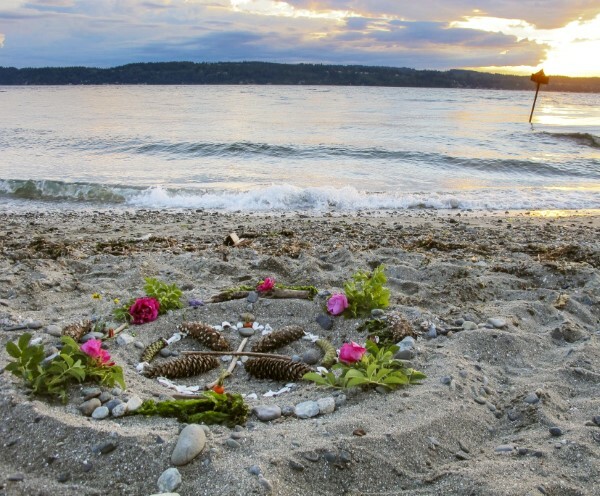 First, find a space in your garden that feels right and is asking for a mandala to be built. This may be a small space you see regularly or one that is a little out of the way. Next, spend a few minutes gathering materials from the garden—leaves, twigs, seed heads, flowers, stones, and such. Then give yourself time to let the creative juices flow. Start in the center of the circle and build your design outward. It can be helpful to focus on one word—abundance, joy, love, or peace, for instance—as a prayer while you build. What are your favorite colors? What moods do these evoke, and what feelings do they bring up? Experiment with noticing how you feel in the presence of various colors. Cool colors such as green, blue, and violet tend to be calming, while hot colors such as reds and bright oranges can be energizing. You may instinctively know which colors attract you and which repel you, which you want to include and which you want to avoid. The ancient Chinese practice of fengshui makes specific recommendations about where to place certain colors in relationship to the entrance and other energy centers in the garden. You can follow a formal system like this or trust your own intuition to guide you, which is my own preference. You might add more of the colors that represent qualities you want to increase in yourself or your life. Cool, calming colors can strengthen an inward spiritual focus, while warmer colors can help you feel vibrant and celebratory. Textural contrasts are also interesting and stimulating to eyes, especially to those that have stared at screens for too long. Every plant has its own unique aesthetic defined by overall form, size and shape of leaves, vein pattern, and presence of blossoms or berries. It’s fun to pair one plant with another, or several, to make a beautiful tapestry in the garden. You can also add textures that are pleasant to touch, such as the soft leaves of lamb’s ears, a cool spongy cushion of moss, or scented geraniums that reward your caress with a fuzzy texture and a whiff of relaxing fragrance. After you come back inside from making your mandala and feel the euphoria of experimenting with Euphorbia. Make sure you grab a copy of Creating Sanctuary. The mandala exercise was just one of two weeks worth of rituals at the very end of Jessi’s book. The previous 200 pages are filled with many more ideas for making your garden into a sacred healing space. Hi Joyce, me too. Did you know she has a workbook too? I just saw it on Instagram. How fun!